We stock a range of Cat Litter Trays including; Extra Deep Litter Trays, Litter Trays with Rims and Hooded Cat Litter Trays that minimise mess and unpleasant odours! The Hooded Litter Tray shown below includes a convenient carry handle, extra high rims which help to prevent litter from being scattered, non slip rubber feet, dual charcoal filters to help absorb odours, a clear cat flap for privacy, four latches to securely hold the litter tray to the enclosed hood, a litter scoop and litter tray liners. 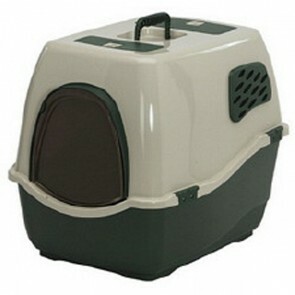 The Marchioro Hooded Cat Litter Tray shown below is the largest within the range, ideal for households with more than one cat, that is manufactured from durable, hardwearing plastic that is easy to clean and maintain, especially as the hooded toilet tray is supplied with a litter scoop and tray liners. Hooded litter trays are ideal for owners with messy cats who like to dig and scatter cat litter around the home and provide cats with a safe and secure place to use as a toilet, but most importantly should save you valuable time clearing up after them! Cats are naturally clean and usually bury a hole in the cat litter first, before going to toilet and then cover the hole by scattering litter around, which often ends up creating unnecessary mess in your home! But as I'm sure your aware some cats like to create more mess than others, but it's not their fault they just want to be clean and we would always recommend you use an enclosed or hooded cat litter tray for those cats and not a conventional cat litter tray to help prevent litter escaping from the tray. We always advise customers not to place their cat's hooded litter tray next to their feeding bowls to avoid litter spoiling food or water and to purchase more than one litter tray to train and encourage young cats and kittens to use the toilet, if they have unsupervised access to more than one room in your house! As your kitten grows older and gets use to using the toilet, you can reduce the number of hooded cat toilets or litter trays in your house, as it will become second nature for your kitten to use the toilet, rather than somewhere less desirable! Unlike many online suppliers we also stock the marchioro replacement cat toilet filters, so there's no reason why your hooded cat litter tray needs to smell unnecessarily! If your cat prefers a conventional litter tray rather than an enclosed tray why not try an Extra Deep Litter Tray which will also help prevent litter from being scattered around the house. 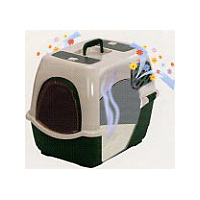 Please visit the Cat Litter Page of this website for advice and to view our large range of cat litters for example; Lightweight, Clumping, Fullers Earth and Woodbased Litters that are suitable for most hooded cat litter trays, enclosed litter trays, conventional and deep cat litter trays shown on this website! Litter Trays & Cat Loos: 5 stars out of 5 based on 4 user reviews. Perfect. Quick delivery. Great product. Have purchased these filters three times now and everytime they have been sent packaged well and received quickly. I would recommend Valupets for service and value and will be back when I need more filters. Couldn't fault it. Bought a self-assembly lidded cat litter box which had a slight problem with one part - poorly moulded plastic clip which prevented lid from closing properly, but after making one phone call this was immediately rectified and a replacement sent next day. Thank you! Would definitely recommend. I have been all over looking for these filters. I am so glad you stock them. I placed my order the other day and they came in the post this morning. Checked out the prices for the other cat supplies I use and you are cheaper than where I buy from now. Great service will use you again when my supplies are running low.